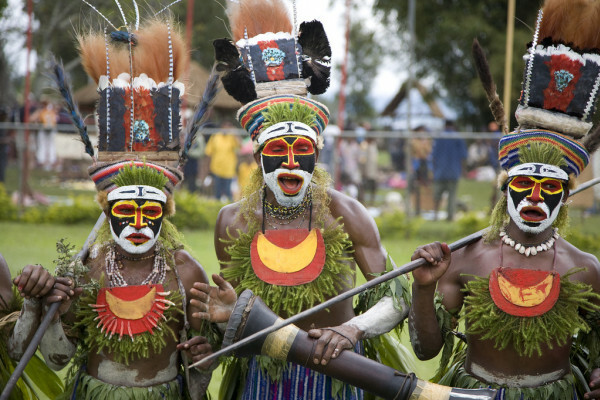 It’s time to take a trip to the Pacific paradise of Papua New Guinea. Humans have lived there for at least 50,000 years, with limited contact from the outside world until relatively recently, and there’s a staggering 850 languages spoken across the country. Now a team of geneticists have carried out the first large-scale analysis of the inhabitants’ genes, and found surprising levels of genetic diversity. To find out more, kat Arney spoke to study leader Anders Bergstrom - apologies for the slightly dodgy Skype connection, not to Papua New Guinea, but to the Wellcome Trust Sanger Institute just outside Cambridge. Anders - We’re interested in human evolution and human history and so, we kind of see Australia and New Guinea as, if you will, kind of a second replicate of human evolution. So, you can ask if things unfolded here in a similar way as they did in Europe, Asia, Africa, and so on. Kat - A kind of microcosm. Anders - You can say that, yeah. As a bit of extra background, as you’ve mentioned, another reason why we think Papua New Guinea is particularly interesting is that this is one of the places in the world where humans invented agriculture. So, this happened independently a few different times at different places in the world so one is in the Middle East, probably somewhere in China or Southeast Asia. It happened in the Americas somewhere and also in the highlands of Papua New Guinea. All of these things happened in the last 10,000 years but probably independently. Kat - What did you set out to do and who did you study? Anders - Together with collaborators from Oxford University and as well as in Papua New Guinea itself, the Papua New Guinea Institute for Medical Research, we had access to an extensive sample collection, DNA samples of people from all across Papua New Guinea. So, we decided to study these samples genetically so then we could get information from each person on what is the state of their DNA at each of those positions. These data then basically allowed us to ask a whole bunch of questions about genetic relationships, both within Papua New Guinea as well as people in the rest of the world. Kat - And what did you find when you started to look at all these data together? Anders - Previously, that’s also been shown that in the coastal areas of Papua New Guinea, there's been some gene flow from Southeast Asia in the last few thousand years. So, in this period they were agricultural people in southeast Asia who sailed down to New Guinea and they mixed with some of the local people in the coastal areas. However, there's a large mountain range that runs through the centre of New Guinea Island. It hasn’t really been known before if this southeast Asian gene flow reached also the people who live in these highlands, in the mountains. And so, what we found was that actually, it didn’t. So the people in the highlands have been completely independent genetically ever since people first reached this part of the world 50,000 years ago, until the present day. Kat - I love the scientific euphemism ‘gene flow’ when really, you mean people coming, falling in love, having families, going down the generations. Kat - Were there any other interesting findings apart from the Southeast Asian people not wanting to go climbing? Anders - The most interesting findings actually relate more to the internal history of Papua New Guinea. Another big motivation going into this project was that we know that Papua New Guinea is extremely diverse linguistically. So, this country has approximately 850 languages. This is approximately 10 per cent of all the languages in the world. Anders: As well as cultural diversity between different groups of people. So, we wanted to know if this great linguistic and cultural diversity was also reflected in the genetic structure of people so that different groups of people who spoke different languages were also genetically different from each other. And so, using this data, we found that this is indeed the case. Different groups within Papua New Guinea are indeed surprisingly genetically different from each other. So despite this being a relatively small geographical area, the genetic differences between different groups are generally larger than any differences you find for example within all of Europe. So for example, if you compare Spanish people and Finnish people - kind of the two corners of Europe in some sense - many groups within Papua New Guinea are much more different than that. Kat - Are there lessons from your findings that we can take to other populations? I’m thinking maybe isolated populations like Iceland or other areas of the world. Anders - Part of the reason why these groups are so different from each other is that many of the groups are relatively small and if you have a small population size then the rate at which you accumulate differences relative to another population is higher. You can see similar effects in other parts of the world. It’s a kind of bottleneck. Iceland is one example but there are many others where small populations accumulate differences faster. So there's an interesting question that kind of goes back not just in genetics but also spanning archeology, linguistics, and so on, about what happens to human populations once you invent agriculture. And also, how does agriculture spread? Does it spread because the people who invent agriculture expand and replace everyone else? Or does it spread just culturally that you see your neighbors growing plants and then you start doing it too? With Papua New Guinea, we can then kind of ask this question independently, what happened here after agriculture? Once humans moved from a hunter-gatherer lifestyle where you live in small groups and you move around across the landscape, and instead you settle down, expand and you start to get little villages and towns, and maybe this would over time lead to a more homogenous genetic structure. But actually, Papua New Guinea then shows that this is not necessarily the case because here, we had agriculture too. People did settle down into villages, but they still retain relatively little movements between groups and the groups remain genetically quite distinct from each other. The real question then is, if both Europe and New Guinea had agriculture, why did Europe end up being very genetically homogenous whereas New Guinea ended up being very diverse? So, we can only speculate about this at this point with the data that we have but what we do suggest is that what made Europe different was that it had a Bronze Age and a subsequent Iron Age, and following cultural processes. And you had similar processes in other parts of the world as well and in East Asia and in Sub-Saharan Africa. Perhaps it was this later technologically driven expansion that in some sense, changed the culture of these regions. People started traveling more, trading more, and this in the long term then led to more genetic mixing and a more genetically homogenous region. Whereas in Papua New Guinea, there was no Bronze Age, no Iron Age. And so, it might have better kind of reflect the levels of genetic diversity as well as linguistic diversity that many human societies would have had before this Bronze Age or Iron Age expansions. An implication perhaps or a speculation rather coming out of this work where we see this very strong genetic structure in Papua New Guinea as well as very high linguistic diversity is that probably, many other places in the world would have also been more linguistically diverse in the past. So, if we again return to Europe as a comparison, the Bronze Age in Europe was associated not just with a great genetic turnover and mixture and replacement, but probably also, a linguistic turnover. So, there's still some amount of debate about this among linguists and archeologists, but the prevailing idea seems to be that with the Bronze Age in Europe which occurred maybe 5,000 years ago, the vast majority of languages within Europe were actually replaced by the languages we speak today in Europe which are the so-called Indo-European languages. There are only a few remaining languages in Europe which are not part of this family. So most likely, before that time, Europe also would have had a much larger number of languages perhaps similar to Papua New Guinea and that they have been then lost and replaced with a single family which is what we speak today. Kat - Anders Bergstrom from the Wellcome Trust Sanger Institute.